Daddy why doesn’t Google trust my site ?? What are the implications of being listed in the Google Supplemental Index ? Is it true that your website will loose all rankings if you are in the supplemental index ? How long does it take to get out of the supplemental index ? How can I get out of Google Hell ? Are just a few queries bringing traffic to my blog, documented in real time by hittail (I’m a real hittail fan). The Dreaded Supplemental Results Of course, someone just *had* to ask about supplemental results and what causes pages to be banished there. (This is one of the most common questions that I hear at all SEO/SEM conferences.) Dan provided us with some insights as to what the supplemental results were and how you could get your URLs out of them. He explained that basically the supplemental index is where they put pages that have low PageRank (the real kind) or ones that don’t change very often. These pages generally don’t show up in the search results unless there are not enough relevant pages in the main results to show. He had some good news to report: Google is starting to crawl the supplemental index more often, and soon the distinction between the main index and the supplemental index will be blurring. For now, to get your URLs back into the main results, he suggested more incoming links (of course!). How can I stay out of the Google Supplemental Index ? to his great surprise my blog was listed before his. "Papi" [that’s how Thomas calls me] "why is your blog listed before mine for my name ??" 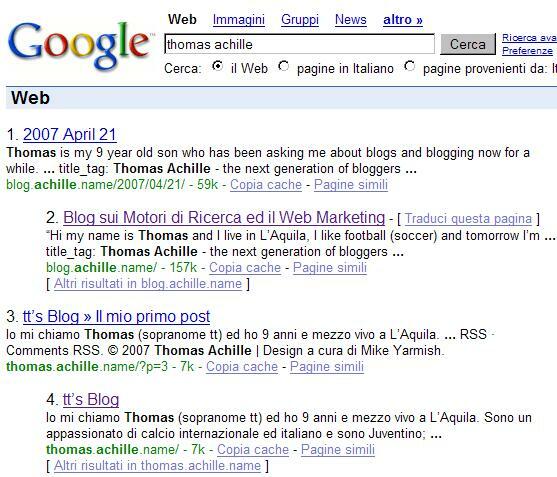 "Well tt [I call him tt] you see your blog is new and you’re a newcomer in this world: Nobody knows you, the search engines don’t trust you as much as they trust me, so they believe me more than they believe you – so if I say you are Thomas Achille they believe me and trust me more. For the search engines to trust you more than me you need to write interesting things that people will read and pass on the word that you write nice things so others that will come to read what you have to say …"
You too write interesting things, become a respectable authority in your field, work very hard and you’ll be seen as a website worth listing ahead of your competition. There’s no need to worry about supplemental results. Of course there are still ways to trick the search engines but they are all short term strategies. Plus the next update is looming! Writing duplicate content can make nearly 100% of your normal results appear in the supplemental results too. This is to counter-act the bots copying peoples websites. Thank your for this nice posting and the tips. I will use them for our corporate blog. Watch out for duplicate content – Google really doesn’t like it! Great advice here though. you as an authority (on GG – I looked you up on ASK and youâ€™re #4 in organic). read this post: Daddy Why doesnâ€™t Google trust my site ? and youâ€™ll see what I mean. It is a sad reality most people cannot see past the Short term strategies, thanks you for the great tips.